I first starting collecting hockey cards when I was a young boy. I can still remember buying my first packs of 1969-70 O-Pee-Chee NHL cards. In those days I was just buying cards simply because they made watching the games on television more interesting as I got to know the players better. It was not long after this when O-Pee-Chee released a sub-set of cards from the famed 1972 Summit Series (commonly referred to as the ‘floating head’ design). I suppose that this was the very beginning of my collection of Team Canada cards as I still have those exact cards that I pulled from packs more than 40 years ago. By 1979 I had stopped collecting cards and never really got back into hockey cards until the 1990-91 season when Upper Deck came on the scene to make collecting exciting again! I fell in love with the Upper Deck 1990-91 Team Canada cards and was once again bitten by the collecting bug. I have not stopped collecting since, but at times need to be a little selective with my collecting to allow it to fit in my budget. 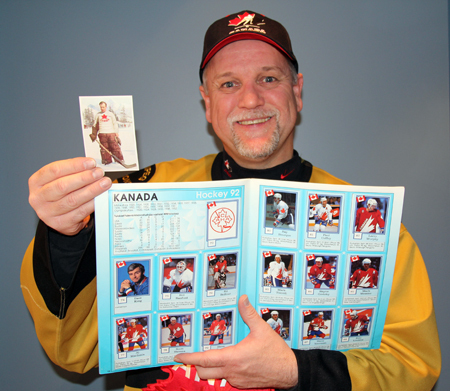 My goal in the early 90’s was to attain every card that pictured a player wearing his or her Team Canada jersey. Although this was a daunting task with so many parallel cards starting to show up at that time it was a goal one could accomplish. At least I thought so. Then I started to discover the European cards of Team Canada players that I had no idea were out there. 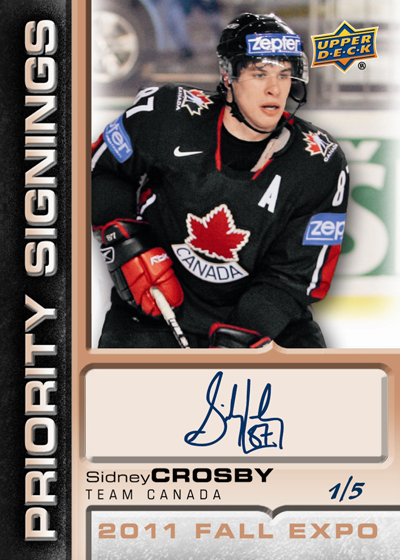 Consequently, I now have cards of players wearing their Canada jersey from international countries like Sweden, Finland, Norway, Germany, Switzerland, France, Russia, Czech, and Austria among others. A major hurtle for me was finding out what international cards really existed for Team Canada Hockey players. 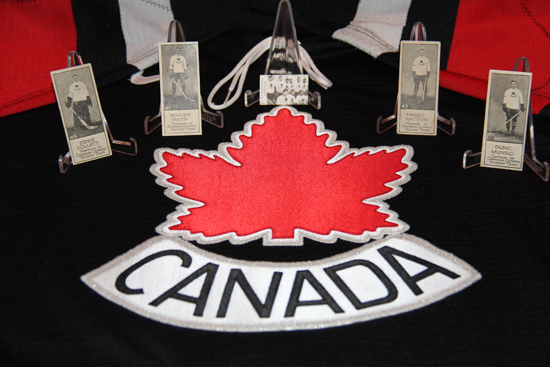 One of my biggest challenges was to find a very small card of Team Canada that appeared in Sweden way back in 1936. I know of only two of these cards that still exist, one is in my collection and the second is in a collection housed in Sweden. Another of the great hunts that I had to go on was to find the four different 1926 Willard’s Chocolates cards of Team Canada players. This was a larger set that featured all sorts of people from different walks, including these four hockey cards. After many years of searching, Harvey at AJ Sports here in Toronto was the one who came up with these cards for me. After he told me he had these cards “somewhere,” I had to remind him for a few years to get searching for them. He finally did and now they are my treasure! For me much of the success I’ve had with putting my collection together has come through the help of many dealers and collectors I have shared my collecting goals with. It is amazing to me how helpful collectors can be in helping another collector put together a set or trying to track down cards you really are not sure exist. I’d like to thank all the people who have helped me build the collection I have today. You really make this hobby so much fun and rewarding. My collection is now 45 binders full and has become more than I ever could have thought possible. With all of these cards and stickers I do have some absolute favourites such as; 2004-05 Upper Deck Summit Superstars Legendary Signatures which is a small collection of 20 beautiful cards containing authentic hard-signed autographs. Another favourite in my collection is the 1999 Upper Deck Jersey cards of Wayne Gretzky. Now I have many Gretzky Canada jersey cards from Upper Deck and this still remains number #1 in my heart, although the 2011-12 Upper Deck Ultimate Collection Jersey card of Gretzky comes in a close second! Another favourite of mine is the 1990-91 Upper Deck World Juniors. Not an expensive set, to be sure, however I still remember being blown away by the idea of the Team Canada Juniors having a card set! 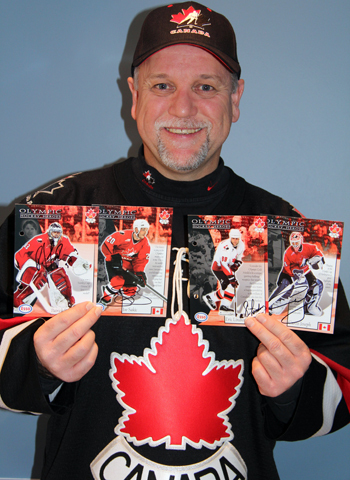 I also love the 2013 Upper Deck 5×7 cards which were produced for Hockey Day in Canada. While the set was great, the jumbo cards were super cool! The 1996-97 Upper Deck Black Diamond release with the gold parallels was awesome too, especially with the inclusion of the gorgeous Joe Thornton rookie card. I also loved the 1998-99 Upper Deck Team Canada Jersey cards of the World Juniors, including the hard-signed version of a young Vincent Lecavalier. I also really love the Upper Deck 2009-10 Clearly Canadian cards which were a set of 42 clear acetate die-cut cards. 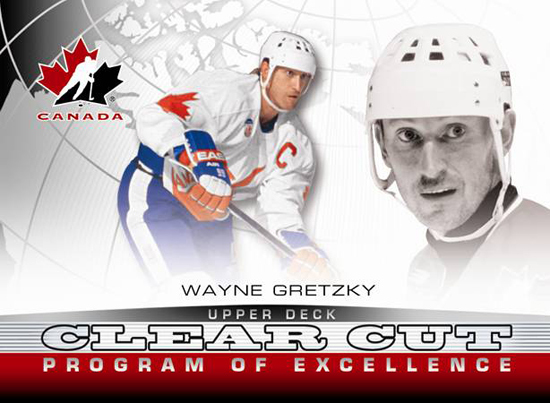 Destined to be a huge favourite will be the new 2013 Upper Deck Team Canada collection! I am very excited about this massive collection by Upper Deck! I can’t wait to add these cards to my collection! From what I have seen in early pictures, these cards look awesome! Other favourite cards from North America are the 1997-98 Valu Net phone cards, a collection of 24 phone cards that came in multiple variations, including 22 hard-signed versions and two versions of a Gretzky card from Japan. The 1994-95 Score Platinum parallel cards of seven Team Canada players are not supposed to exist, but with help I was able to track them down along with the 1994-95 Donruss Elite set of 22 cards commemorating the Juniors fourth consecutive gold medal. A really big favourite of mine is the 1997-98 Esso set of authentic autographed cards. My collection of these cards doubled when a fellow collector in Calgary gave up on trying to finish the set and sold me his autographs. Some of my favourite European cards include the 1969-70 Swedish Mastar-Serien set containing 23 cards (that I know of) including card #192 of Ken Dryden that is not supposed to exist, but does in my collection. I have added the 1936 Swedish ALFA card of Team Canada to my collection as well. Other favourite European cards include the 1997-98 Eurotel set containing eight Team Canada cards, the 1994-95 Finnish Kiekko card set containing 38 Team Canada cards and the 1994-95 set of Swedish Semic Sport cards containing 27 Team Canada cards, as well as the 1992 Finnish collection of Team Canada hockey stickers. Another grouping of cards that are a lot of fun are Upper Deck’s Priority Signings autograph cards that are available through the wrapper redemption programs at the semi-annual Sports Cards & Memorabilia Expos in Toronto, Ontario. One of the reasons that I go to the Expo is expressly to track Team Canada versions of those cards. Right after the redemption program ends I really love running around that big room like a kid to see who has them available for sale or trade. It is so much fun! I would love to hear from any fellow collector who can help with any of these five cards. If anyone is interested in seeing my fulfill want list, please contact me at teamcanadacards@gmail.com. 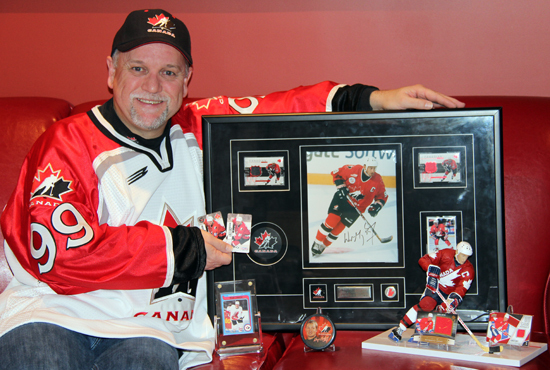 I am always interested in networking with any other Team Canada collectors out there – perhaps I can help you out with your collection! Thanks for sharing your story and your collection with us Danny! And good luck with future Team Canada Hockey sets from Upper Deck! Sounds like an awesome collection! I myself collect Team Canada cards, I just past the 1200 different card mark! Thanks for reading the Blog on my collection! Sounds like you have a really good collection on team Canada as well. Perhaps I can help you with your collection. If you would like, please contact me at the email address given at the end of the Blog and I will be more than happy to help you with anything that I can. Great collection, nice to see some of the old stuff in there. I have two of the cards from your top 5 wantlist, if I ever decide to part with them, I’ll make sure to keep you in mind!! Incredible collection indeed, great article! Fantastic to see such an extensive collection put together. I would love to hear more about what you have from the most wanted list! Please send me a note via the listed email. Very impressive story and passion for Team Canada! I am starting my first Team Canada set with the 2013 set. Will be interesting to see what you add to your collection from this set. I too love the Team Canada Cards. My favourite to date is the 2009-10 SP Game Used Marks of a Nation set. Still looking for a couple of Team Canada cards, but I’m well on my way. I managed to get myself a Dale Hawerchuk (Gold/Black) /6 Letter “C” from a nice gentleman from Calgary. Being from Winnipeg myself, I have great admiration of the talent “Ducky” had playing on a less fortunate team. This card even isn’t listed as produced by Upper Deck.